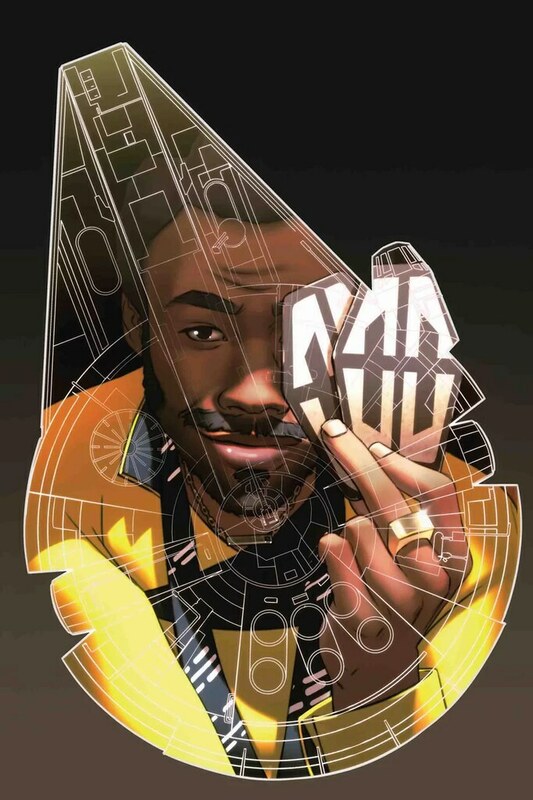 Lando – Double or Nothing #5 brings the mini-series to an end as Lando helps the Petrusians fight for their freedom. Along the way, L3 gets to fight in a battle along with a bunch of droids against the Empire. Plus, there’s a tie-in to the Solo movie. But it’s not quite enough to make this series worth the money. There’s a lot of action and dialog as Lando fights alongside the Petrusians to help them in their rebellion. As a surprise, they activate a droid army to help them fight the Empire. L3 takes the opportunity to fight with them, and surprisingly they lose the Falcon to the Empire. What I did not foresee is the mini-series uses this as a tie-in to the Solo movie. Rather than trying to fight their way in and get back the Falcon, L3 advises them to track the Empire and see where they stash the Falcon…then steal is back. As it turns out, the Empire puts it in impound on Vandor. The issue ends with Lando going there and starting up a card game. Overall, the story in this issue isn’t too bad. I liked the way they tied it into the movie, thus giving this comic some relevance and importance. On the other hand, I really don’t like the way Rodney Barnes wrote Lando. It’s been too over the top for the entire mini-series, so much that I can’t thoroughly enjoy it. Plus, L3 doesn’t feel quite right in her dialog either. That hurt both this issue, and the series as a whole. The artwork is okay. It’s not great, but it’s not bad. There’s a nice representation of the action and the characters, but it’s not a style that delivers a lot of jaw dropping panels. The best art is the cover by W. Scott Forbes which looks gorgeous. With an okay story and okay art, I give Double or Nothing #5 a three out of five metal bikinis. The tie-in at the end of the issue makes it worthwhile to check this one out, but I’d recommend just skimming it and reading the end without purchasing it. It’s not a series I’d pick up in trade paperback.